Join us as we explore the Cape May National Wildlife Refuge's Two Mile Beach Unit. Formerly a part of the Coast Guard base, just south of Wildwood Crest, the Two Mile Beach Unit contains barrier island (with beachfront) habitat, tidal ponds, and some of the last remnants of maritime forest habitats in southern New Jersey. 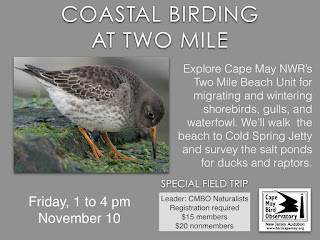 As we walk the beach to the Cold Spring jetty, we'll see shorebirds, gulls, and waterfowl, as well as offshore migrants such as Northern Gannett and scoters. We'll also visit the duck blind to view the salt ponds for wintering ducks and raptors. If time allows, we'll visit a nearby back bay location for additional wintering waterfowl.